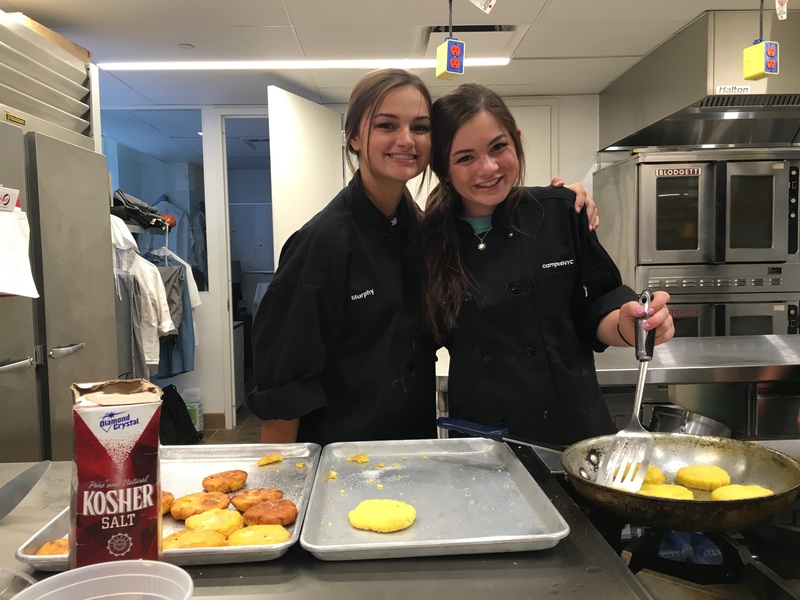 CampusNYC | Our Kitchenssummer cooking class: campusNYC is the premier summer cooking class for teens. 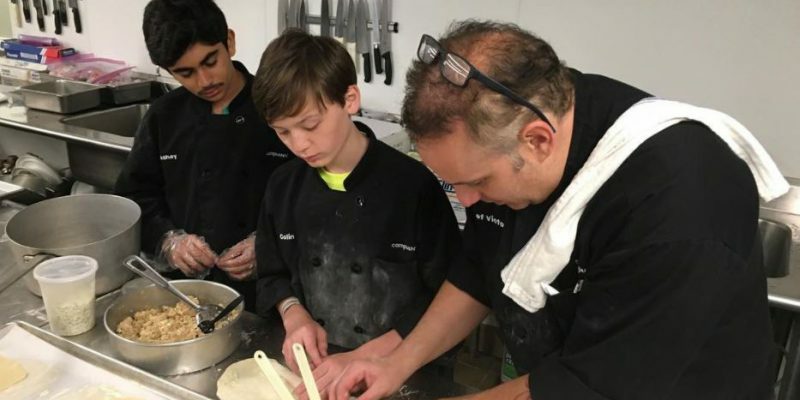 We work closely with the students as they work through their recipes in our state-of-the-art professional teaching kitchen! 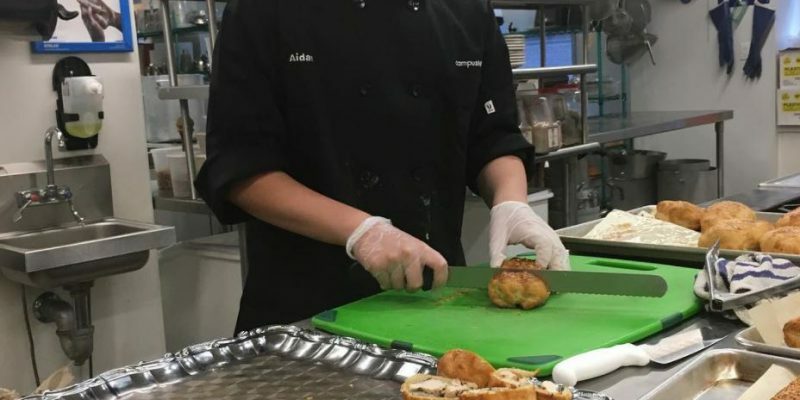 Can you see all the amenities behind Aidan as he is cutting his Wellington? This kitchen has it all! Prepping more delicious food in our state-of-the-art kitchen! Top-Notch Facilities – Two Pro Kitchens: This year our summer cooking class will feature two distinct kitchens, one each dedicated solely to either pastry or savory. Our kitchen spaces are large, professional, and equipped with professional-level machines of all sorts. 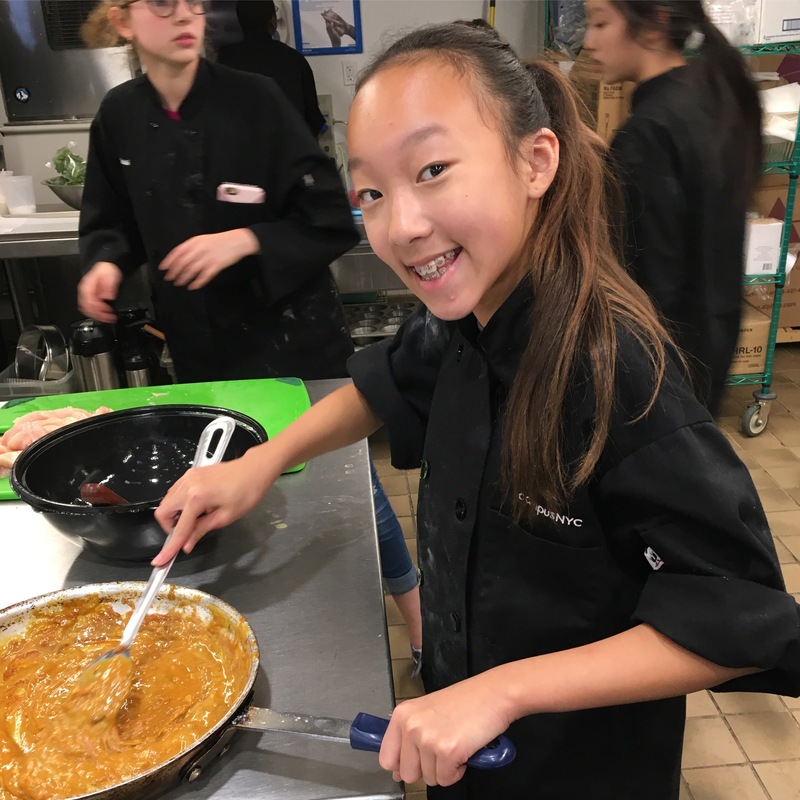 This is of course a critical component to our summer cooking class configuration, and one of the best reasons to choose our program. If your child desires to learn from the best, and digging deep into over 100 recipes, then top-notch kitchens are required. Professional – level kitchens are a must! Savory: Our savory students will again work out of the Food Arts Center at Fedcap. Fedcap offers a wide array of programs and services to help young people achieve success in education and employment and become happy and self-sufficient adults. Most importantly, Fedcap is our partner in providing us exclusive access to their premier teaching kitchen. This professional-level culinary teaching kitchen is brand-new, bright, clean and awesome. It features lots of space, professional high-end equipment, smart screens, and much more. Our students will be well taken care of in this safe and secure space. In addition to the kitchen, we will also have access to other areas within the Fedcap building classrooms for our academic component. 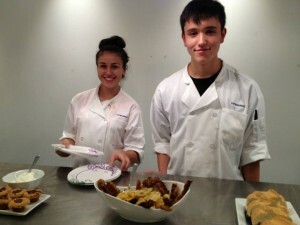 2 students from Dallas, TX enjoying the summer cooking class in NYC! It is our staff that makes the program so spectacular. Our summer cooking class is about skill-building. It is about trying things yourself, over and over. It is in friendly competition, where everyone helps everyone, and the spirit of try-and-try-again lives on. Our staff will SHOW the students what to do, how to do it, and right in front of them. We will help the students gain critical understanding. And we will bring in outside chefs for one-day courses in things like sushi making and desserts. If we know an expert in a certain area – and we know a lot of them – we will bring them in and let them go nuts in our kitchen. Food and flour flying everywhere and suddenly we’ve made the most delicious cake… and so on and so on…. Special Guests: During our classroom-based academic portion of the day, we sometimes mix it up by having special guests. They could range from sushi chefs who show us how to hand-roll sushi, to a local legend like Jimmy Prince. Our intent is to give the students access to information and education in a hands-on way that is second-to-none and unparalleled in scope and depth. Last summer one of our guest speakers was Jimmy Prince, The Butcher of Coney Island. He has been featured in tons of magazine and newspaper articles and has 50+ years of experience working as a butcher and running his own shops. He talked to our students about meat, cuts, quality, presentation and much more. He showed us how to identify the best cuts, what to look for in the shops, and what to think about while cooking. It was amazing! Vegetarians/Vegans: we have alternative protein cooking we can substitute for this lesson! Happy campers at our summer cooking class! 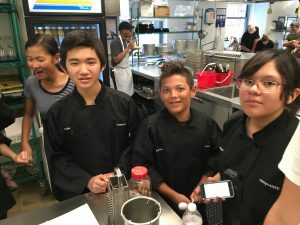 More happy students at our summer cooking class, getting ready to plate their creations. 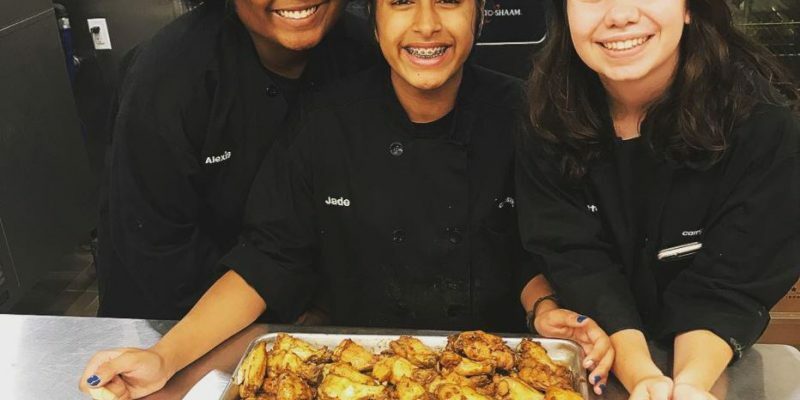 All smiles at our summer cooking class!